A skyscraper for students, environmental charges for vehicle traffic, a national stadium for 50,000 spectators and investments amounting to 20 SEK billion  a year with Stockholm’s first female Mayor, Annika Billström. She has worked throughout 2004 to bring together the city, the business community and the neighbouring towns of central Sweden on a common agenda that make Stockholm the most exciting region in northern Europe. This agenda involves a series of measures under the headings Green City, Knowledge City, Events City, Design City and IT City, and also includes forward-looking investment amounting to SEK 20 billion, primarily in housing and infrastructure. 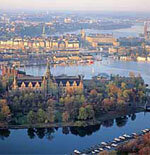 Stockholm is today a world leader in the work of protecting the environment and achieving sustainable development. To enhance this role and ensure that Stockholm will continue to be an attractive city for its inhabitants and visitors, Annika Billström and the majority group in Stockholm have this year allocated SEK 1 billion to the cleaning of waterways, lakes, and land for housing, the improvement of waste disposal systems, and the protection of valuable green areas and water in and around the city. She has also decided to introduce environmental charges for vehicle traffic, to reduce congestion and improve the inner-city environment. This will take place on a trial basis from the summer of 2005 to the summer of 2006, after which the people of Stockholm will be asked, in a referendum, to decide whether it should continue. This trial period is expected to generate income of around SEK 1 billion to be invested in public transport, used today by 80 per cent of Stockholmers. To achieve changes in transport and fuel use, public transport and ”green” cars will be free of charge. The number of petrol stations offering green fuels is also being doubled, and the City of Stockholm is ”greening” 60 per cent of its vehicle park. Under the heading ”Knowledge City”, Stockholm is focusing on developing the fields of biotechnology and biomedicine in which it is already a European leader. Annika Billström, working with the University and the business community, is heading up the work of creating a new urban development area, with around a thousand new jobs and houses, in the northern part of the city, home to the Karolinska Institute  renowned for its research  and the University Hospital. 2004 also saw the decision to locate the EU’s new European Centre for Infectious Disease Control in Stockholm. Annika Billström has also secured the city’s pruchase of Stockholm’s best-known skyscraper, the ”Tax Scraper”, formerly home to the National Tax Board. The building is now being converted into 600 student homes, right in the middle of Stockholm, as part of Stockholm’s work to attract more students. From autumn 2004, students will also be offered a student package consisting of an Internet information site and discounts and free benefits in entertainment, sport, culture and other events. These are some of the measures that have led to Stockholm recently being ranked as Europe’s foremost knowledge city. This year, Stockholm has achieved a position as one of the world’s most popular locations for congresses and other events, a result of focus on the work of attracting large, important fairs and congresses to Stockholm. Annika Billström has also this year presented a proposal for a National Stadium for sporting and other events that can hold 50,000 spectators. The stadium could be ready by 2006 provided it achieves the backing of the Swedish Football Federation. Stockholm is also an international leader in IT and telecom, a position that has been consolidated despite the international recession. Kista Science City, the city’s IT and telecom development park, attracted 70 new companies in 2003 and a further 30 in 2004. There are now more companies in the area than there were during the boom. In its Mobile City work, the city is working very actively to create more mobile services for Stockholmers. Additionally, one of the city’s municipal housing companies decided in 2004 to provide broadband in its entire property stock, which means that the City will be giving 90,000 Stockholmers  already the most connected population on the globe  access to broadband. 2005 is the Swedish Design Year. Stockholm has responded to this by producing a package of measures to develop this business area, through creating a cluster of companies, colleges, education courses and other actors in design and creation, and also by opening a design centre in Stockholm in 2005. In 2004, it also became clear that Stockholm will host the country’s only international design fair, FutureDesignDays.